What Is the Role of Disabled Actors? As a disabled playwright, John Belluso said, “Disability is the minority no one wants to join but anyone can fall into at any time.” Society fears disability because it is the only minority we could all become part of. So how can we, as a society, put an end to this fear? Here’s a solution: Cast more disabled actors. Nearly 20 percent of the American population lives with a disability. As an amputee, I am in this minority. Yet it’s estimated that less than 2 percent of roles on TV exhibit any disability, and the actors playing those roles may not even be disabled themselves. On "Glee" the black character is played by a black actor, the Asian character is played by an Asian actor, but the character in the wheelchair isn’t actually played by a wheelchair-bound actor. This must change. Acceptance of artists with disabilities must be gained with the same awareness that has been achieved by artists of color and other minorities. The Screen Actors Guild publishes a Casting Data Report that provides the industry with an analysis of employment trends in film and television related to ethnicity, age, and even gender. The industry does not report information about hiring actors with disabilities, and therefore, little is known about their employment. Our disability doesn’t have to be featured. In fact, I’d prefer it be shown as a natural character choice. On "Breaking Bad," Walter White’s son has Cerebral Palsy. His character demonstrates the exuberance and independence as well as the challenges of life with a disability. In this same show, however, one of the Mexican Cartel brothers loses his legs when he is hit by Hank’s car, and he is mocked for it. His character is a bad guy, I get it. But consider this true story of an amputee. He drops his daughter off at school in New York City, stands behind his car and suddenly gets hit by a taxi and loses his legs. This man is not bad, but because of scenes like the one above in "Breaking Bad," society is more likely to be afraid of him. This leads me to a trend I’ve noticed. Most amputee characters in movies are the bad guys! Think about it. Darth Vader, Dr. Curt Connors from "The Amazing Spider Man," and Lieutenant Dan from "Forrest Gump" are all amputees. These amputee villains play right into the mindset of society. We fear disability and want to think that if life is “fair” then the good guys can’t become permanently disabled. But this happens to more than 500 Americans every day. Why should those fears get projected onto amputees? At the end of "The Hunger Games," Peeta is a determined young man and an amputee. At the end of the movie, he is only a determined young man. Why this change from paper to screen? Not only have these writers missed the opportunity to cast an amputee actor, but they also could have incorporated the grueling psychological trauma of losing a limb into his character. This loss would have demonstrated that one can still be the good guy and live with a prosthetic leg. It seems that only biopics are used to convey a person living with limb loss as inspirational. "Soul Surfer" and "127 Hours" are good examples. Does this mean that our society can’t even begin to imagine and create an amputee protagonist? Or is it that we’re afraid to imagine the good guy becoming an amputee? Some of the strongest people I know live with a disability such as limb loss. Being disabled is defined as lacking power and lacking physical or mental ability. This is how disabled characters and actors are viewed; this is why we aren’t getting leading roles. Adapting is defined as adjusting to different circumstances. People living with a disability shouldn’t be thought of as lacking; we should be known as adjusting. We learn to live in new bodies and new minds. Shouldn’t these qualities make us some of the best actors around? I still want to perform on Broadway. However, few disabled actors are cast as a character not specified as having a disability, and there are hardly any disabled characters in plays and musicals. I can hide my disability, but I’d appreciate the opportunity to expose it. My dream role is Sarah in "Time Stands Still." She’s injured in an explosion, and that would give me the chance to incorporate my amputation into her character. It’s disheartening that I’ve never heard of a disabled actress playing this role. Casting directors are constantly missing these opportunities. 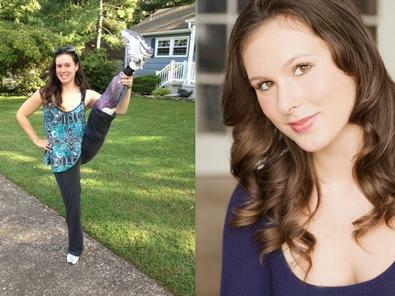 My life didn’t end when I lost my leg. In some ways this is only the beginning. Being disabled is being different. We aren’t born thinking different is bad, but that’s what we’re taught. From a young age we learn that Captain Hook is a bad guy because of his physical deformity and his actions. The only way to end this fear of disability is to accept that it can happen to the good guys, like Arizona on "Grey’s Anatomy." Stop portraying us as the villain and start casting disabled actors. Allow yourself to ask questions about my prosthetic leg. Let me show you that I’m a person living a fulfilling life with a disability. Let me show you that there is nothing to fear.